British Army patrol in Sandy Row, Belfast. 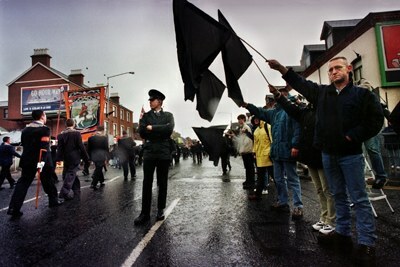 Loyalist communities were rioting in support of the Orangemen..
Catholics stand in silence holding black flags as Orangemen march past down the Lower Ormeau Road. 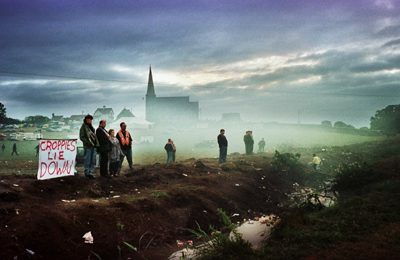 The church at Drumcree, near Portadown, Northern Ireland in July 1998. 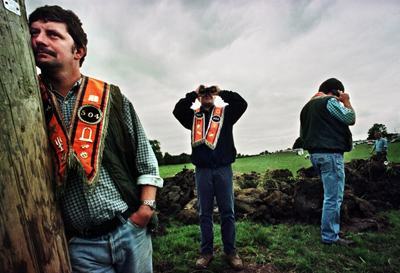 Loyalist protestors seen from the Garvachy Road side trying to breach Army defences between the church and the catholic population on the Garvachy Road. 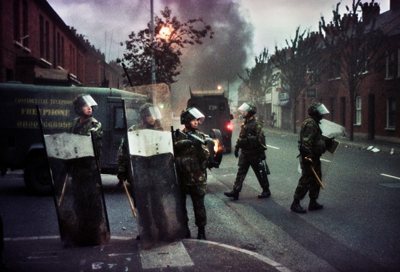 Dawn on the third day of the stand-off between the Orangemen of Portadown and the RUC and British Army Forces keeping them from marching back into Portadown via the Garvachy Road, a predominantly catholic area. Croppies is an eighteenth century insult refering to captured catholic prisoners who would routinely then have their heads shaved. 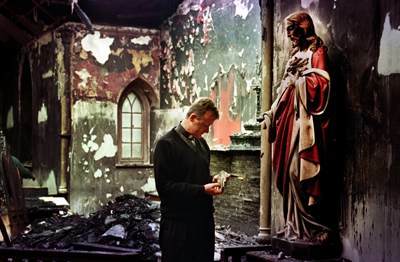 Father David Delargy, a priest at St James church, Crumlin, holds a broken hand from a statue of Christ in the 200 year old chapel. 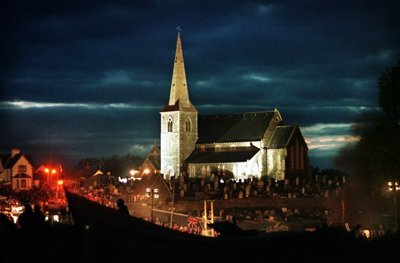 The chapel was firebombed along with seventeen other catholic churches across Northern Ireland during the first week of the stand-off at Drumcree in 1998.